So, it’s late Sunday night, and you’re just waiting for a bus, minding your own business, staring out into the parking lot, checking your phone, thinking, “Man, I hope this bus gets here soo….WAIT, WHAT!?! IS THAT A PLANE TRYING TO LAND IN THIS BUS BAY!! !” One young man waiting for the bus last night got quite the surprise. At approximately 10:45 p.m. Sunday, May 2, pilot Darrick Helmuth, 27, of Plain City, OH, made an emergency landing in the MetroBus bus bay lane at the Fairview Heights MetroLink Station in Fairview Heights, IL. Flying from Columbus, OH, Helmuth was trying to reach St. Louis Downtown Airport in Cahokia (coincidentally also owned and operated by Metro) and reportedly ran out of gas. Capt. 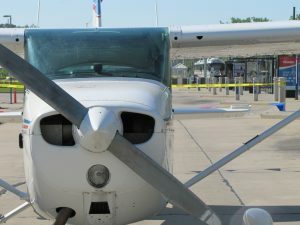 Steve Johnson with the St. Clair County Sheriff’s Department reported that Helmuth tried to make his way to the Cahokia airport, but had to make an emergency landing in the 1978 4-seat Cessna. Capt. Johnson said the pilot saw the lights from Metro station and decided to land. 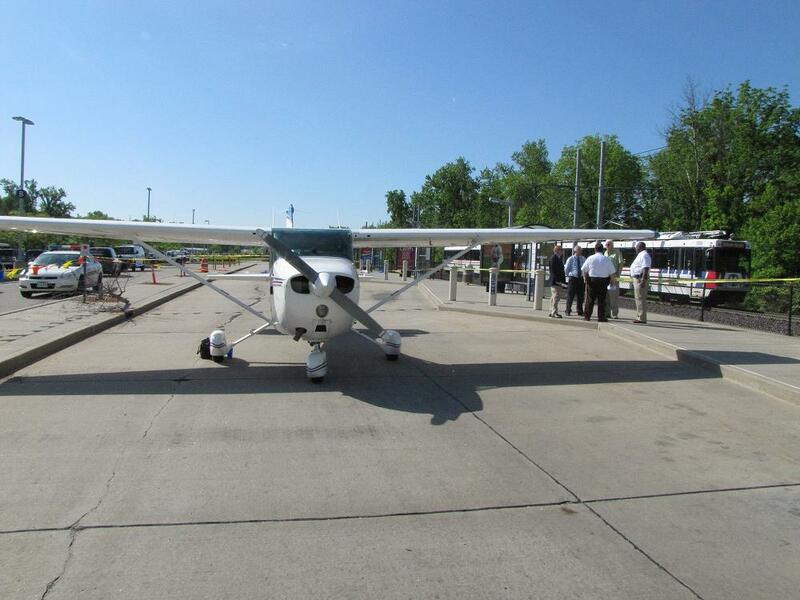 The small plane has a 36-foot wingspan and 8-foot wheelbase, but Helmuth guided the craft safely onto the bus bay lane, which is 26 feet wide and 600 feet long. No injuries were reported, and the station only had minor property damage (one small tree did not clear the wingspan). Metro security on the site radioed for emergency help and assisted the pilot. Extra security was kept at the Fairview Heights Station all evening for customers’ protection. There were no delays to MetroBus or MetroLink. Today, the pilot and others helped tow the plane out of the bus bay lane and into a grassy area where the plane will be disassembled and hauled out of the station at the owner’s expense. Regular MetroBus service returned to the bays by noon on Monday. Certainly was an unusual day for our Metro riders and security. We’re certainly glad that the pilot, witnesses and everyone involved is uninjured, and hope the plane and Helmuth have a safe return to Ohio.